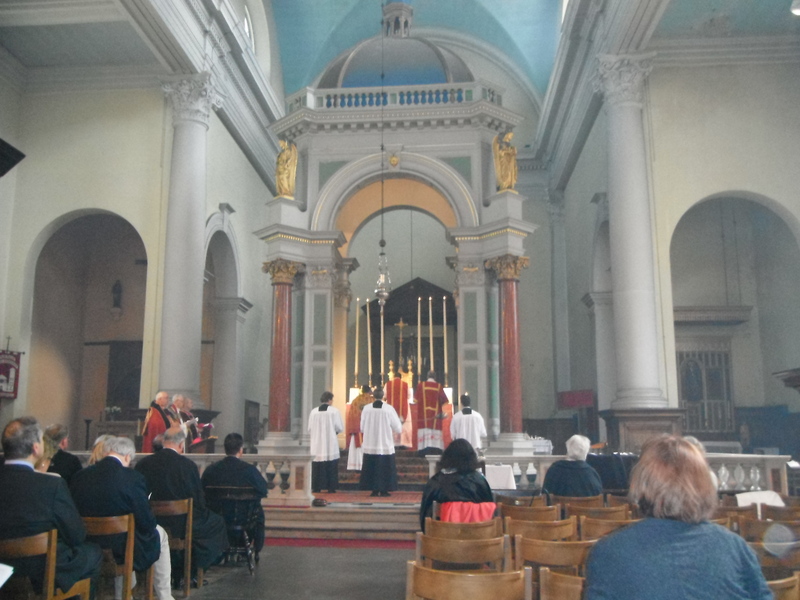 A service of investiture for the Order of St. John of Jerusalem Knights Hospitaller (British Association of the Russian Grand Priory) took place at the Church of the Most Holy Redeemer, Clerkenwell, London, on Saturday 30 June, by kind permission of the church authorities. Under the aegis of the Grand Master, Alexandre Tissot Demidoff, and the Prelate, the Most Revd. Howard Weston-Smart, the Prince-Abbot and Archbishop Douglas Titus Lewins (Primate of the Old Roman Catholic Church of Great Britain) were installed as Chaplains of the Order, and additional new members were invested. The Mass was celebrated according to the English Missal, and Archbishop Lewins preached. After the service, clergy and members of the Order joined in warm fellowship at a nearby restaurant. The Russian Grand Priory in exile was founded in 1928 in Paris, through the work of Paul Demidoff who brought together descendants of the original Family Commanders of the Russian Grand Priory founded by Emperor Paul I in 1798. Their concern was charitable works and in 1939, membership was extended to non-Russians with an Association in Paris as well as an Association in the UK, the USA, Hong Kong and Latvia. Each association takes on a major project in fundraising. In the UK, the major project is to support the Royal Society of Medicine in subsidizing access to expensive books for downloading over the web electronically for those in training. The Danish Priory supports an orphanage in Russia and the Hong Kong Priory supports cataract operations for those who cannot afford them. The recent Charity Golf Day in the UK raised nearly £10,000.